DESCRIPTION: Bio Cucumber Pore Tightening Toner, With Himalayan Waters. This refreshing, pore tightening toner brings the complexion into perfect pH balance and helps keep skin in its purest state. Cucumber is one of nature’s greatest cooling and Purifying plants with many health benefits. This refreshing, pore tightening and Purifying lotion is blended with cucumber, coriander, nutgalls, berberry, peppermint oil and the fresh waters found in the foothills of Himalayas. It is formulated to bring the complexion into perfect pH balance and help keep skin in its purest state. TO USE: Apply to cotton pads or washcloth and gently wipe over cleansed face and neck, morning and evening. 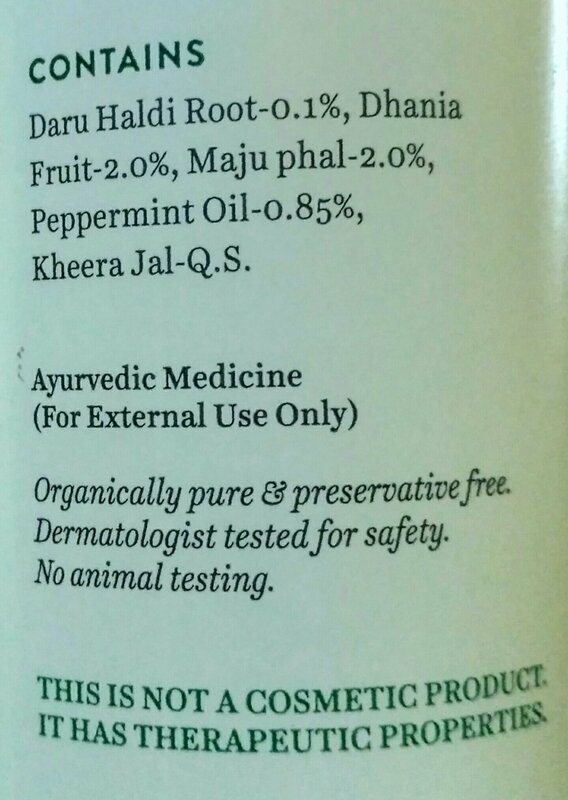 Daru haldi root 0.1%, dhania fruit 2.0%, maju phal 2.0%, peppermint oil 0.85%, kheera jal q.s. Till date I have tried on Toners from many different brands.. From Ayur to Keya Seth to fabindia and many more! 2. Soothing fragrance that it quite relaxing to the senses. 1. Makes my skin feel a bit dry and stretchy. FINAL TAKE: I really love this toner as it helps control the oil secretion on my face. The drying part is not really important for me as I follow it up with a Moisturizer. But it might be quite drying for normal skinned girls! Cucumber has amazing skin toning properties, but drying up is an issue since my skin is a dry one. But still the rest benefits are good. This toner seems like a great for summer… It instantly gives cooling effect to skin which is very much required during this hot weather… Will check this out.. This toner looks good. I actually have to buy one and I was looking for a good one. Thanks for the review. I have been using cucumber toner from Biotique and love the product to the last nail. Very effective on my oily skin. It is really good for oily skin types! Cucumbers leaves a wonderful freshness on the skin and also it really keeps my skin hyderated. 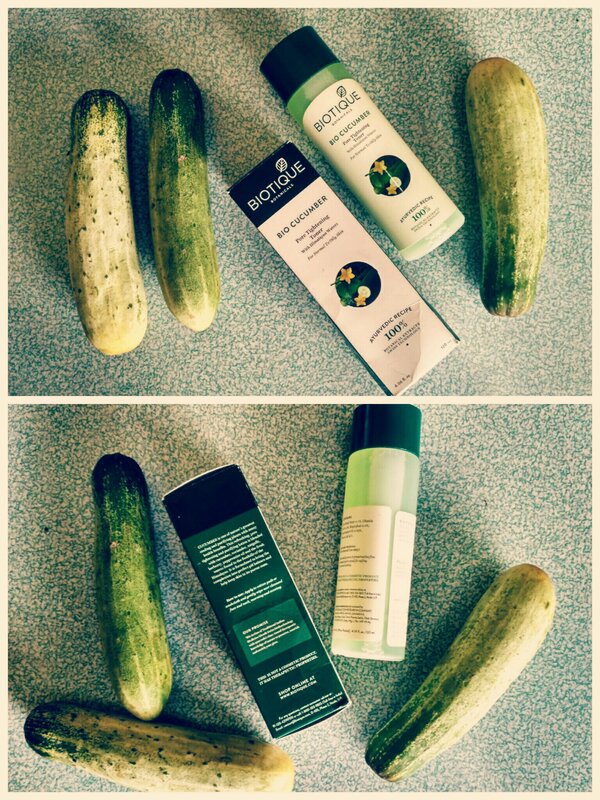 Cocumber has great skincare benefits specially cooling effect. I heard amazing things about this brand and this toner looks like a great product. This toner is great for oily skin, except the fact that it contains alcohol! I like to use cucumber toner . It instantly cools down and soothes skin irritation and burning. Used to use and love this. recently switched over to another for the same drying factor. The Biotique pore tightening toner looks to be pretty good. Pics have come out very well and makes it more appealing and attractive. Will definitely share with friends.